Since its foundation in 1869, it has become a landmark in the Barcelona neighbourhood of Poblenou. Located at the heart of the Rambla del Poblenou (the main street this neighbouthood), it has turned into the focal point of cultural activity for this community. The current building dates from 1944. In its emblematic Sala Grande, kept just like the day it was built, with a tilting floor that can be transformed either into a dancing venue or into a theater, and the cork roof which gives its unique acoustic characteristics, it holds all kind of shows, such as theater shows, concerts, high-quality sound recordings, filmmaking and other type of events, like meetings, banquets, conventions, etc. To sum it up: not only it is a beautiful historic room, but its wooden parquet flooring, its spacious width and its exceptional acoustics will make your Friday night a very special one. The Hospital de la Santa Creu i Sant Pau came into being in 1401 with the merging of six hospitals in the city of Barcelona at that time. Santa Creu, the Hospital of the Holy Cross, as it was called in those days, was right in the centre of the city, in what is now the Raval district, in one of the most important examples of Catalan Civil Gothic architecture. By the late nineteenth century, due to the rapid growth of Barcelona’s population and advances in medicine, the hospital became too small, and it was decided to construct a new building. Thanks to the bequest of the Catalan banker Pau Gil, the first stone of the new hospital, designed by Lluís Domènech i Montaner, was laid on 15 January 1902, though the new facilities would not be opened until 1930. After eighty years of healthcare activity in the Modernista complex, in 2009 the Hospital de la Santa Creu i Sant Pau moved to new premises built in the north of the precinct, thus commencing a new era for the historic pavilions of Domènech i Montaner. Built towards the end of the 19th century, this was the first place to be specifically designed as a public park. It is a widely used space for all kinds of leisure and cultural activities. It contains over a hundred species of plants, with a large number of century-old trees and interesting sculptures. Ciutadella Park has a large number of century-old trees and a wide range of elements: the monumental waterfall, 19th-century buildings now used as museums, a lake for rowing boats, pathways and numerous sculptures. It shares the site with the city zoo. This park is located next to the sea, in a land where once was a factory of Catalana de Gas. 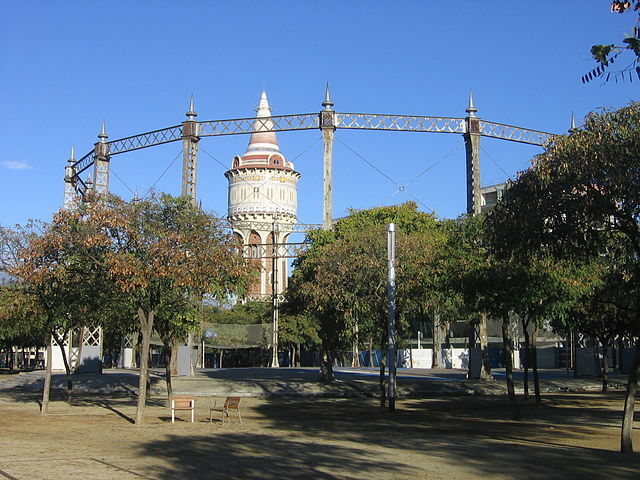 There is a water tower and the metal structure of a gasometer, designed by engineer Claudi Gil Serra in 1868. The tower is a work of modernist design by José Doménech y Estapá, from 1905. From the old factory, the office building is also conserved, built in 1907 by Domènech i Estapà.